Zynga, the titan of time-wasting, is broadening its distribution base with a new social network called “Zynga With Friends,” where players can build profiles and connect with other players while wasting epic amounts of time, according to the company, which announced the plans on Tuesday. In addition to giving gamers a new go-to destination for flushing their lives down the toilet, the move is interesting because Zynga With Friends will be an alternative to Facebook, where most Zynga games are currently played. Indeed, it’s worth noting that Zynga With Friends replicates many of the features and capabilities offered by Facebook, including profiles with pictures and interests, messaging, chat, and status updates. It also offers real-time multi-player mode, for simultaneous collaborative game-playing. Zynga With Friends can be accessed via multiple platforms, including laptops, smartphones, and tablets. In a bid to spread buzz and build traffic, the company is opening Zynga With Friends to other game developers, including Phospher Games, Sava, Crashlab, Fatpebble, and Atari (yes, you read that right: Atari is producing a game for Zynga to commemorate its 45th anniversary). Zynga has long hinted that it would like to lessen its dependence on Facebook, which takes a 30% cut of revenues generated through sales of virtual goods to casual gamers. These revenues, in turn, still make up a substantial part of Facebook’s bottom line -- some 11% of total revenues in the first quarter, plus another 4% from advertising on Zynga games. While Zynga still relies on Facebook’s payment system for sales on its own site, strengthening its own site may be a preamble to setting up its own payment system, heralding the end of revenue sharing with Facebook (at least for games played outside Facebook). That would be more bad news for Facebook, which is struggling to demonstrate sustainable growth to Wall Street analysts and investors. If advertising revenue growth continues to slow, this would leave Facebook all the more dependent on revenue streams like Zynga’s virtual goods sales -- just as Zynga is pulling away. In a blog post dated June 12, 2012, I posted a body of evidence that strongly suggests that Zynga's best days may be over. Nearly all of its games, including its two biggest winners, Farmville and Mafia Wars, have experienced drastic drops in monthly/daily active users between Janaury and May 2012. These are not good times for Zynga. It's IPO on December 16, 2011 was considered a flop. Shares came out at $10.00, but dipped to $9.50 at the end of trading. It's share speaked at $14.69 on March 2, 2012, but have declined dramatically since that date. As of today, Zynga's stock (NASDAQ:ZNGA) have dropped to 5.44, with a market capitalization was only $4.01 billion. Rumors that they maybe acquired by Facebook are rampant. Analysts have downgraded the stock believing that its business model is not sustainable. Whether Zynga With Friends will allow it to keep its traffic numbers and retain most of its revenues remains to be seen. Most of the articles I have read believe that unhitching itself from Facebook, could be a huge mistake. Facebook will also feel the loss. Zynga's gross revenues for the year ending December 31, 2012 were $1.140 billion. It paid Facebook 30%, or roughly $330 million. It ended the year with a net loss of -$404 million. R&D for the year ending December 31, 2012 was $727 million. Zynga needs new hit games with lasting power. However, recent trends show strong evidence that social games are losing popularity, and users are flocking to other gaming or entertainment sites. I have yet to find a single social media or stock analyst that believes in Zynga anymore. At Google's I/O Developer Conference 2012 , Google officially unveiled its new Nexus 7 tablet. The 7-inch tablet is the first and currently only device shipping with Android 4.1 Jelly Bean, and takes advantage of its optimization for smaller tablet screens, magazines and movies. Google Android 4.1 Jelly Bean. Quad-core Tegra 3 processor running at 1.3Ghz. Near field communication (NFC) capability. An in-plane switching (IPS) LCD screen with 1280 x 800 pixels is a trait found in pricier tablets. The Nexus 7 tablet includes a $25 Google Play credit and a slew of bundled content. There's no SD card slot, however. The Nexus 7 tablet is available for ordering through Google Play (and possibly local stores) in Australia, Canada, the UK and the US with a mid-July shipping window. COMMENTARY: This is the presentation video from the 2012 Google I/O keynote, where Google announced they will be releasing a new tablet, called the Nexus 7. The Google Nexus 7 will be manufactured by Asus, has a 7" screen with 1280 x 800 resolution, and will use a Tegra 3 processor. The device will cost $199, is available to order today through the Google Play store, and will ship in July. Although Google claims that the Asus Nexus 7 tablet is competing against Amazon's Kindle Fire 7-inch tablet, the Nexus 7 is a superior tablet, so I don't see the Kindle Fire as its chief target. The Google cloud is becoming more Apple iCloud-like everytime I look at it. I still believe that Google will eventually take on the iPad. And why not, it has 500,000 apps, 250,000 developers, Google cloud to support Music, movies and mobile apps, plus synchronization on any Android mobile device. It's starting to look more Apple-like to me. I thik what we are seeing is the transformation of Google from a pure-play search and software company to a hardware company, with control over the entire Android ecosystem. Yup, I think Google is after Apple, not right now, but definitely by 2013. Over a period of three years Tesla Motors developed the Model S sedan from the ground up with persistence and passion. In my personal opinion, the Model S sedan is the classiest, best designed and engineered all-electric vehicle for mass production. Yes, its pricey, but in terms of design and engineering it stands head and shoulders above anything coming out of Asia or Detroit. Nothing even comes close in terms of overall design and performance. If you haven't see the Model S all-electric sedan, click HERE or checkout all of my blog posts for Tesla Motors by clicking HERE. This morning Paul Thurrott, the well-known Microsoft watcher, writing in Windows IT Pro, detailed a number of Windows 8 features that Microsoft either mentioned or alluded to in its presentation last week in San Francisco. Improved device management for enterprises. The company has yet to detail the full set of consumer-facing features that Windows 8 will contain. COMMENTARY: I think including MS Office 2013 on Windows 8 phones is a fantastic idea for the reasons given in the article. However, creating a spreadsheet on a mobile phone is not very productive due to the small screen footprint. Hopefully, MS realizes this, and if MS engineers are smart like they were in designing Microsoft's dazzlig Surface tablet, they will provide a separate keyboard or larger screen phone like the Samsung Galaxy S3 phone. That phone comes with a stylus that allows you to doodle, write comments on emais, drawings, etc. The Surface tablet, with a 10.1-in screen, so it might be logical to assume that MS will come out with a larger Windows 8 phone as well. That's not a prediction, but I think Samsung's phone will start a trend of bigger screen mobile phones. The Nokia Lumia 610, 800 and 900 series phones running Windows 7.5 OS have larger screens. My favorite is the Nokia Lumia 900 with a 4.3-inch screen. That's nearly an inch bigger than the iPhone 4S. The handicap is the slower 3G speed, slow processor and screen resolution. However, Lumia phones running Windows 7.5 offer tight integration with Microsoft Office (see below). The screen resolution should not be a handicap, as text readability is excellent and you can see images much clearer than the iPhone in bright sunlight. Somehow, I have a feeling that Nokia will produce an even bigger screen on their next Lumia 900, that will allow MS Office 13 to really zing. Rumors are already circulating that a future iPhone will come with a larger screen. There's always a new platform you should sign up for, or a new feature you need to learn about. And everyday you're reminded of just how far behind you are. By simply addressing a few mistakes with your social media strategy, you can improve your results and finally catch your breath. Here are 3 social media mistakes you don't know you're making. People always want to know "how many Tweets per day should they send" or "what day should I schedule my blog posts? But these questions are usually pointless. Social media can't save your brand. If you're providing a product, then make it the most innovative, unique and easy-to-use product in your space. If you're providing a service, then make go above and beyond expectations to deliver the best possible customer experience. If you're writing a blog post, then make it the best, most actionable or information-packed post possible. Instead of worrying about your Klout score, start thinking about your Net Promoter Score. To calculate your company's Net Promoter Score (NPS), take the percentage of customers who are Promoters and subtract the percentage who are Detractors. Red Bull and Oprah both have a huge social media presence because they're the best in their business... not because they Tweet 15x per day or started using Pinterset last month. One of Jobs' first goals as CEO was to review the company's sprawling product line. What he found out was that Apple had been producing multiple versions of the same product to satisfy requests from retailers. For instance, the company was selling a dozen varied versions of the Macintosh computer. Unable to explain why so many products were necessary, Jobs asked his team of top managers, "Which ones do I tell my friends to buy?" When he didn't get a simple answer, Jobs got to work reducing the number of Apple products by 70 percent. Among the casualties was the Newton digital personal assistant. Unfortunately, the cut-backs also resulted, in part, in a workforce reduction of about 3,000 employees. "Deciding what not to do is as important as deciding what to do," Jobs says in the book. "It's true for companies, and it's true for products. People and companies are struggling with the same problems today when it comes to social media. There's too many opportunities, too many new features, and too many new shiny tactics to try. But here's the problem. Unless you're in the Fortune 500, you're probably short of (1) time, (2) energy, or (3) money. If you want to stand out, then you need to be exceptional. So instead of spreading yourself too thin, focus everything on one major platform or social network. How do you decide? Where are your customers predominately? What activities will give you the highest marketing ROI? Maybe that means you hire a blog writer and focus mainly on content creation and email marketing. Or perhaps Pinterest for your business is a waste of time, so you can ignore it. Or there's the possibility that Google+ is essential for your business because you rely on SEO heavily. Either way, the point is that if you can answer these two questions and act accordingly, then your marketing results will double in no time. Marketing guru Seth Godin says that one of the biggest mistakes marketers (and companies) make, is being "impatient". But what does that mean? Who can be patient when there's bills to pay and competition coming after you? When Seth said marketers need to be patient, he meant that if you want to make a sale next week, you can't start marketing today. You should have started three years ago. You can't throw a Hail Mary pass in the last minute of the game and expect to win the game. Marketing and sales only work if people trust you. And that process takes time. In the simplest terms possible, there are two ways to market online. Use advertising to "rent" attention. Use inbound marketing to "earn" attention. But guess what? Both are going to cost you something. If you don't have the time or energy, then you need to spend money on advertising. If you don't have money to invest, then you need to spend time and energy in creating content, building relationships, and learning a basic SEO strategy. You won't have hundreds of visits each day when you launch a new website. Traffic won't just fall out of the sky. You need to You need to understand how to get traffic that will convert into loyal subscribers. And you then need to pick the right online marketing channels for your unique business, and work them consistently, every single day. Because mastering these techniques is what separates the amateurs from the pros. And at the end of the day, you'll feel more relaxed and have results to show from it. COMMENTARY: The Social Media Examiner recently published their 4th Annual Social Media Marketing Industry report. Each year they interview marketers about how they are using social media to grow and promote their businesses. Below is a graph from the annual report that shows the percent of marketers who have seen specific benefits from using social media marketing. An interesting change from the 2011 to 2012 report is the percent of marketers who said social media marketing helped to improve search rankings. In 2011 62% of the marketers interviewed said that their search rankings improved, but only 55% of the marketers interviewed in this year’s report saw a benefit. I found this change very interesting since I have experienced improvements in search rankings using social media campaigns in the past. After examining the report further, it appears that those who saw improved search rankings were investing more than 10 hours a week in social media, have at least 3 years experience, or are selling to other businesses (B2B companies). There appears to be a direct correlation between the amount of time invested and experience on search ranking. However, industry is a large factor, as only 50% of businesses who sell to consumers saw a significant increase in their search rankings. B2B companies are more likely to grow business partnerships using social media than B2C companies. Spending 6 hours or more a week on social media shows a significant increase in lead generation. Small business are more likely to see an increase in lead generation than large companies. Those with 3 and more years experience managing social media see a significant increase in all the measured benefits compared to those with less experience. Over a third of all mid-sized and large companies have not seen a reduction in their marketing expenses. This is very interesting, I wonder if social media is seen as an additional marketing effort not a replacement for other marketing at this time. A not surprising find, social media is great for generating site traffic. 74% of marketers saw increases in site traffic when investing minimum 6 hours a week in social media. B2B companies use social media for gaining marketplace insight much more than B2C companies. B2C companies have a much larger increase in their loyal fan base when using social media than B2B companies. 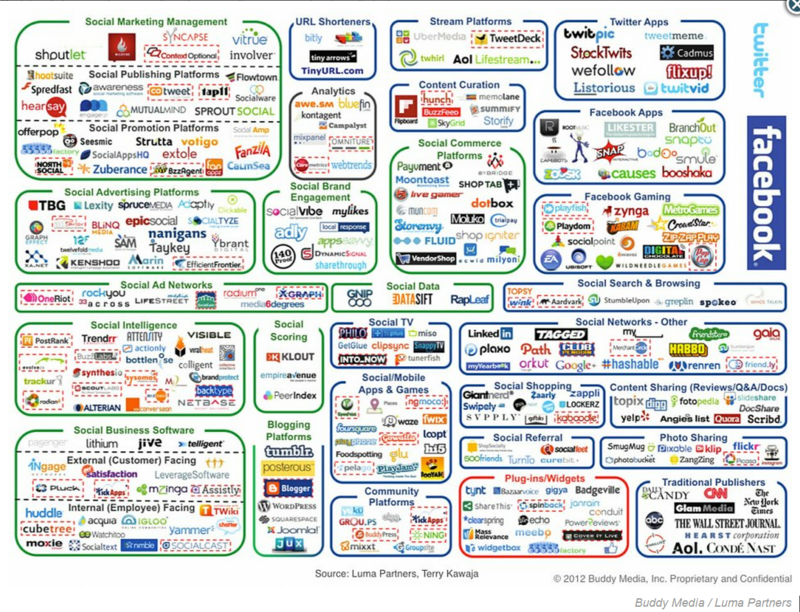 Check out the full 2012 Social Media Marketing Industry report on the Social Media Examiner site. According to the 4th Annual Social Media Marketing Industry report, you MUST be prepared to spend time and resources into social media in order to generate measurable benefits. If your goal is to generate increased website traffic, sales leads and brand loyalty businesses MUST be prepared to invest a MINIMUM of 6 hours per week in social media marketing activities. This takes time and effort and money. You cannot go about your social media activities haphazardly or lackadaisily. According to the report, Companies that have been using social media for 3 years or longer, generated the most measured benefits. The electric vehicle world is pretty quiet right now; following the much-hyped launches of the Nissan Leaf and Chevy Volt (and subsequent criticisms of the Volt’s safety), there hasn’t been much to pique mainstream America’s interest. That’s going to change soon, when the Tesla Model S, billed as "the world’s first premium electric sedan," rolls off the assembly line. At $49,000 (with a $7,500 tax credit), the vehicle isn’t incredibly cheap--but it’s a bargain compared to Tesla’s old offering, the $109,000 Roadster. And after months of Tesla teasing us with pictures and video, the Model S is finally going to be released on Friday. But Tesla has released some teaser videos of the car in the factory, so we can take a look at the production process of the vehicle. In the video above, we can watch as the vehicle gets stamped. Below, we can see the body center, a place where robots rivet and weld to their hearts’ content. And finally, the assembly center, where high-definition 3-D cameras properly position the panoramic roof, the seats, center console, and the drivetrain and batteries are installed. Exterior components are also added. Then, according to Tesla, comes the industry’s first "all-glass water test booth, where it is sprayed by water from 360 stationary nozzles to ensure your car has perfect water tightness." "Tesla Model S is practical and affordable, as long as you’re rich." And many people agree that this is a make or break moment for Tesla. For the sake of the larger electric vehicle industry, we hope Tesla succeeds. At the very least, the industry could use a little excitement. Stay tuned--we’ll be at the Model S launch this week and will come back with in-person impressions. It’s really happening. In three days, we will be delivering Model S. I've heard from many of you that you would like to be a part of this incredible occasion, and we definitely want you to be there. In order to make this happen we will be providing a live webcast of the event on ourInside Tesla page. Join us from your home, office, or mobile device at around 3:30 p.m. PST this Friday to watch some of our very first Model S customers receive their keys. For many of us, this is something we have been looking forward to for a long, long time. We hope you join us to share this incredible moment.